On the grain size of reality and, eventually, creative work. I thought Max Tegmark’s Our Mathematical Universe was fun – he describes some good thought experiments, such as a suicidal contraption to test an idea that wavefunctions don’t collapse and we instead experience randomness due to a bifurcation of realities with perceptual continuity in only one of them – but I didn’t like that he waited until so late in his book to mention that the theories describe depend upon space being coursegrained. I just flipped through his book again – I first read it a little over a year ago, and was pleased that it fell into two categories of research that I was doing, “theories on whether or not humans have free will” and “ways in which modern science is like mythology” – and in the copy I have he doesn’t discuss coursegraining of reality until page 368 of a 398 page book, or maybe page 316, when the idea is mentioned but not discussed. Which I felt was disingenuous. Not intentionally so, I don’t believe – he was cramming a lot of stuff into the book, and it must have been hard to decide how to organize it. But even if his intentions were good, I feel displeased, because this was a book for general audiences, and would someone who hasn’t thought about this before know to keep that caveat in mind? And it’s possible that the idea of a coursegrained reality is sufficiently popular in the field that this didn’t seem like something that needed to be highlighted: in a footnote at the bottom of page 130 there is an impressive list of physicists whose ideas support the idea that our universe contains a finite amount of information (I haven’t read / even glanced at their work – someday, someday soon, I’ll resume studying physics and mathematics!). But from the perspective of someone who studied physical chemistry, including quantum mechanics but neither nuclear physics not astrophysics, I don’t see any a priori reason to expect finite information or coursegrained reality (which, tiny aside – if there is finite information content, that implies reality is coursegrained. Without coursegraining, every pairwise distance contains infinite information, and our universe has, um, quite a few pairwise distances). Although maybe being made of matter isn’t even part of that pride – if reality were coursegrained, even fields, which most people think of as continuous, would need discontinuities, blipping from one field strength to another as you progress stepwise through space. I’d rather believe reality is smooth. Not that all the theories of the book are invalidated by smoothness. For instance, there is the idea that in a very large space, many copies of something resembling you, in a world resembling yours, would exist. If reality were coursegrained, exact duplicates could exist in a large enough space. But even with smoothness, you could discuss near-duplicates in which the center of every wavefunction in that version was inside a ball of radius x, where x could be very, very small, as compared to our world. Eventually, that reality would deviate from our own, so it would not be identical if you looked far enough back or far enough forward in time. But with small enough x, every interaction would transpire almost the same way in that universe as it would in ours, and so you’d have to look very far into the future to see any difference. Long enough into the future that the copy of you might be dead, the sun might’ve gone dim, etc. So in my opinion he could’ve written about these theories but discussed that caveat earlier. Because I do think it’s important. There’s a difference between infinity and very, very big numbers. Like, I’m sitting here writing. And I’ve spent, what, three and a half years now working on writing a book? And when I write, I feel as though I’m creating something. But that same thing that I imagine I’m creating is already there, waiting to be pulled down from the shelf in Borges’s library. Which sounds a little depressing. So naturally, in order to cheer my brother up, I babbled at length about this in the car recently. My brother is working on recording music, not writing. So in a way what I said to him was cheering. Honest! Because actually, a piece of recorded (um… analogue-recorded, in a non-coursegrained universe) music is one of infinitely many. Or a live music performance. And even if you wanted to bin frequencies at some scale that would seem indistinguishable to most listeners, and set upper and lower bounds for allowable frequencies based on hearing range, and bin times, and amplitudes, you’d have more possible three-minute “songs” than you could have 300-page books. 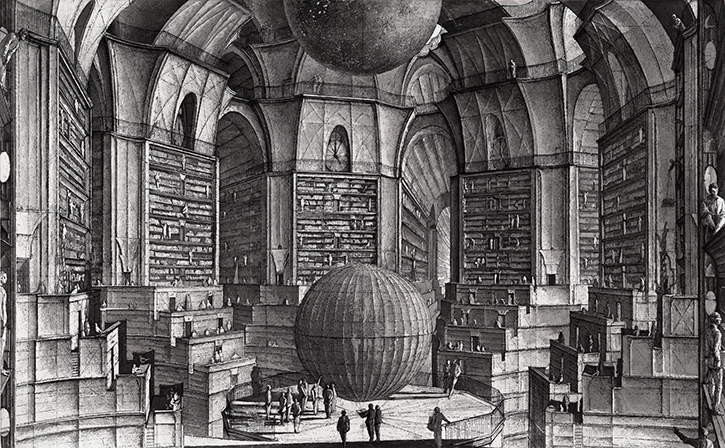 Borges might not have been able to build a library to hold his whole vinyl collection. Still, he could’ve waited and built the music wing of his library in the 1990s, once he switched his collection over to CDs. On free will, a bit, but mostly on graduate school and Rob Peace.